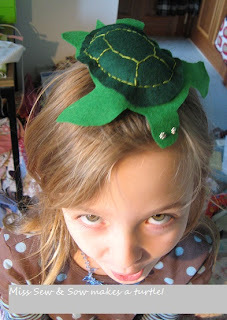 My mother was a great stitcher of many things and I have several of her excellent pieces. 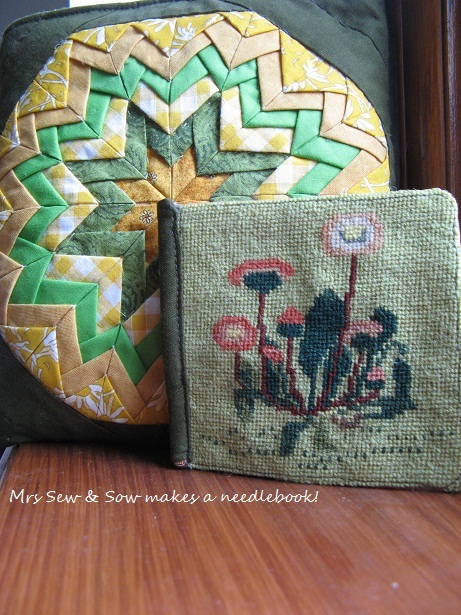 It has always been my desire to make something with them, and one of the pieces I have long admired is a little detailed stitchery in wool on canvas - probably using a Danish pattern - as she liked the naturalistic style of those. This pattern is probably a daisy or Bellis perennis to the afficionados! 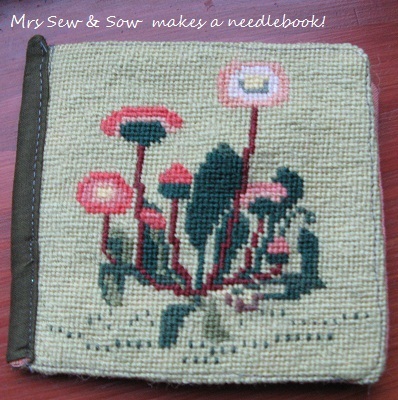 It is really sweet - too nice to stay in a drawer so I have made it into a needlebook! I can enjoy it and use it and think happy thoughts of mum! If you are making something as a sample - why not make it into a little souvenir for someone you hold dear and give it to them to enjoy and use and hold dear in turn! Visits, moving and more Christmas making! Haven't had time to post of late as my sister-in-law has been visiting with her young boys! Forgot what energy little ones have! Phew! 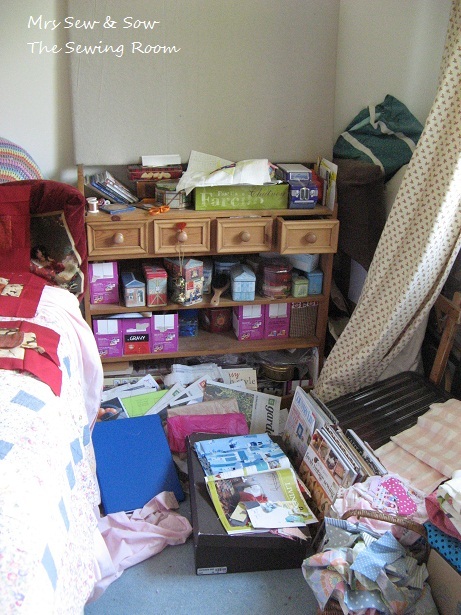 Perhaps a bit too clean?? Well I had been leaving room for a travelcot but my youngest nephew has just moved into a proper bed so shared this large double with his mum! 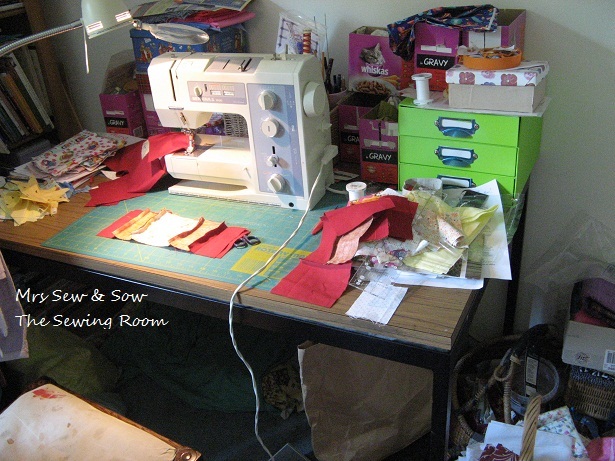 While thinking of tidying up this room I had an even better idea - hence the lack of any sewing paraphernalia! 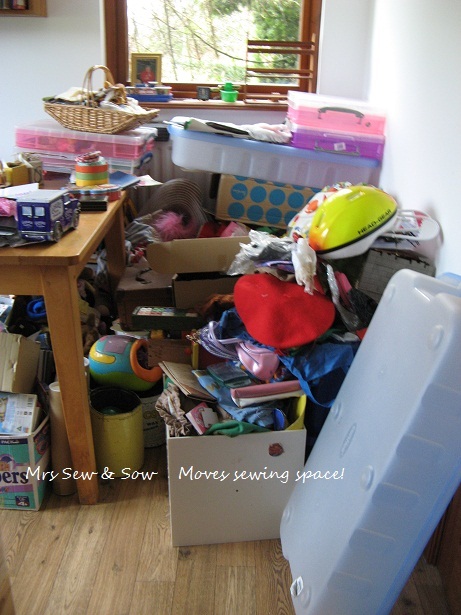 I decided to take over the poor abused playroom downstairs which was needing even more tidying and has not been much in use because of all the mess! 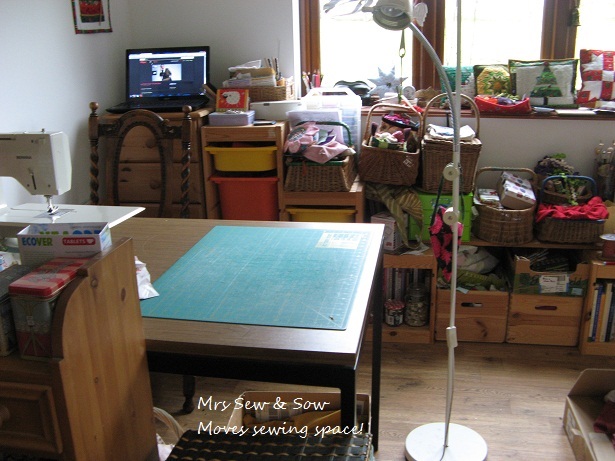 So I ended up tidying two very messy rooms and moving most of my sewing stuff downstairs! I am feeling very cosy down here now with more space, extra light and a hard floor which will be easier to keep clean as the threads used to stick to the carpet before! You can see my trusty table, with cutting mat and sewing machine. And behind are drawers full of rulers, rotary cutters, WIPs. 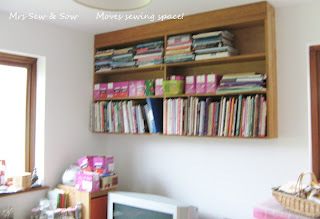 There are books, jars of buttons, boxes full of scraps! 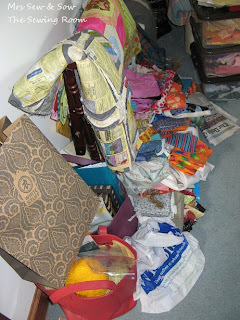 Vintage baskets of fabric and little projects ! Love those! 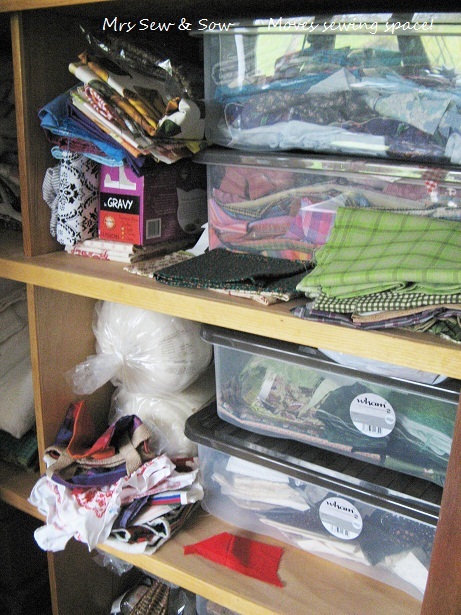 Here you see a lot more books - mainly lace and embroidery ones....and the purple cat food boxes are just the right size for holding patchwork pieces once they have been cut out...it's ok they held pouches of food so are perfectly clean inside! 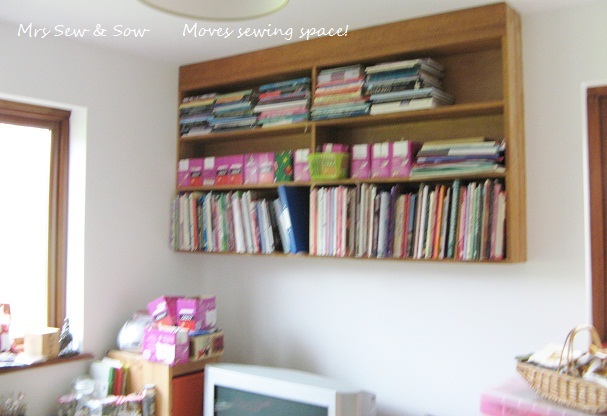 I also have a large built in cupboard ....this is just a corner of it....which is ideal for fabric, part-made quilts, wadding and stuff! 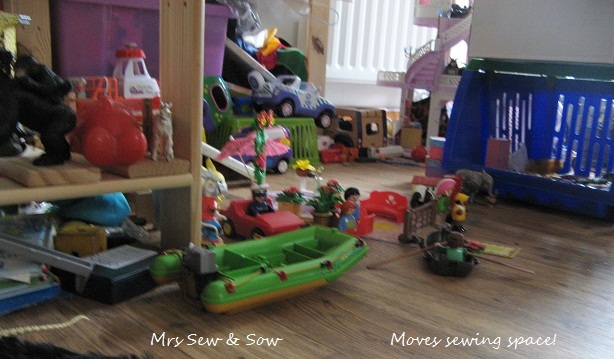 Hoping I can be more productive in here and there is even enough room for a friend - or there will be once I sort out a few more of the toys - time they went to a charity shop or something as they are not being played with anymore! Think that will be a Work-in-progress for a while! 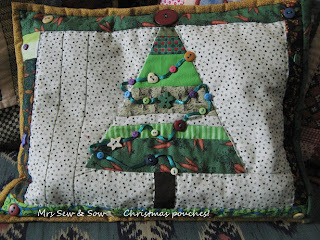 Now I promised a bit of Christmas making....I had the idea some years back of making Christmas bags to wrap presents in as a way out of all the midnight paper wrapping I used to do and to save on the paper. 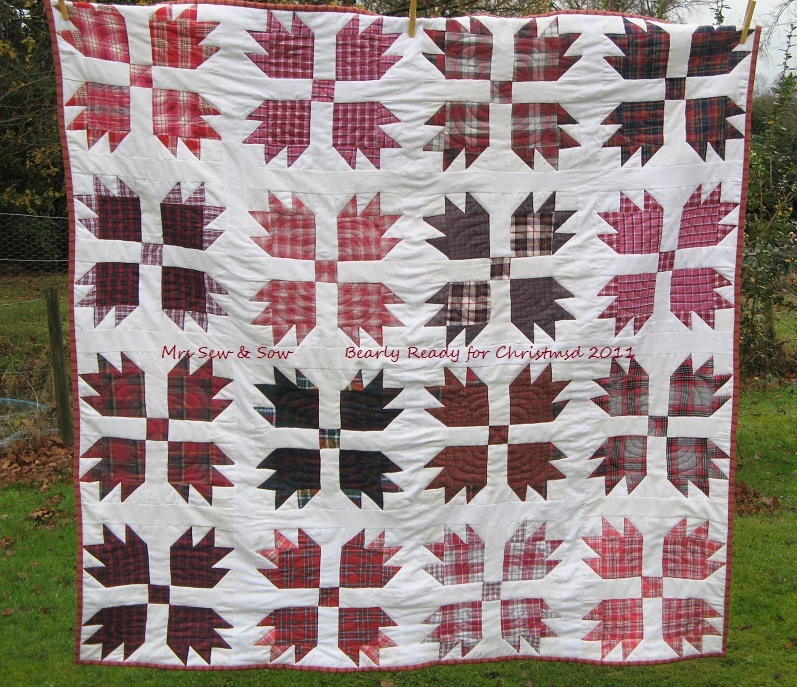 My intention was to make a few every year until I had enough to help poor old Santa! or should I say Mrs Claus! 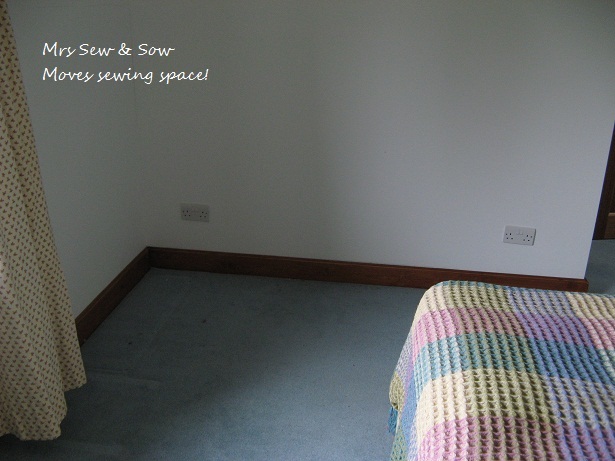 But having started on the project the general feeling was that everyone found tearing paper much more satisfying so I was sort of out voted! So I have finished a few more that I had started anyway! 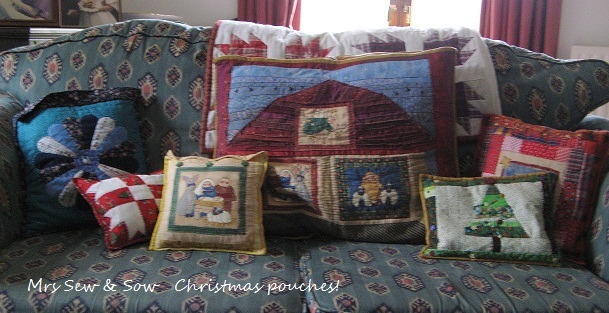 They can double as small Christmas cushions/decorations - and next year if I get my way those men in the house who do not like wrapping may use them for their presents instead of getting me to do their wrapping for them! Maybe need to make some bigger ones...? Making them has used up several orphan blocks and has let me try out a few different techniques. And now that zippers hold no fear for me I can choose between buttons and zips for closing them! 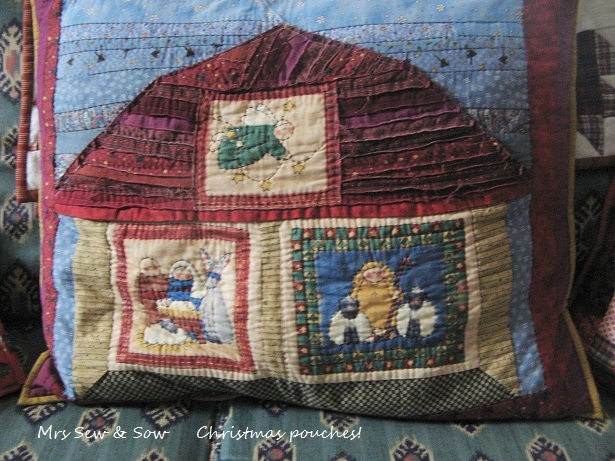 All have blocks on one side and then a printed naive nativity scene on the other! I have two left to finish unless I decide to make some more...in a larger size perhaps!!? Did I manage to finish all my Christmas making in time?? 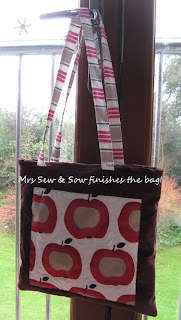 I left you last saying that I had one bag to make and several pouches! 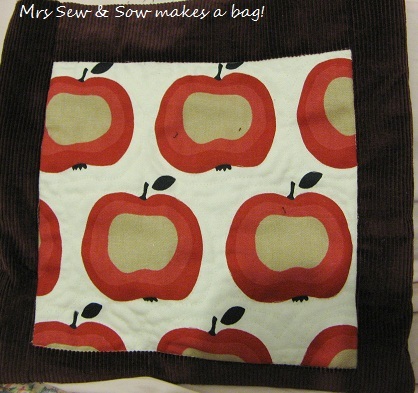 Here are some pouches - one missing until a later date! 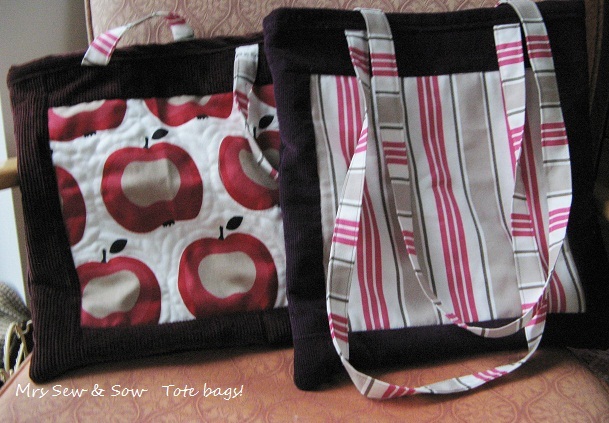 The blue one was the prototype - and the pink is the improved version! Both feature a zipper put in on a curve - slighty trickier to do and requiring a little snipping in the seam to allow the curve! 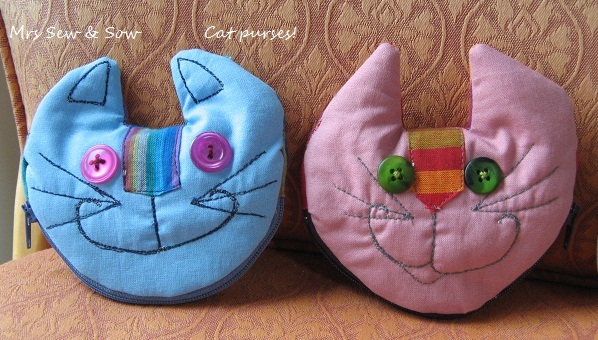 The back is striped in the same fabric as those noses - the blue one has the word 'Miaow' and the pink has 'Purfect' sewn on to them. 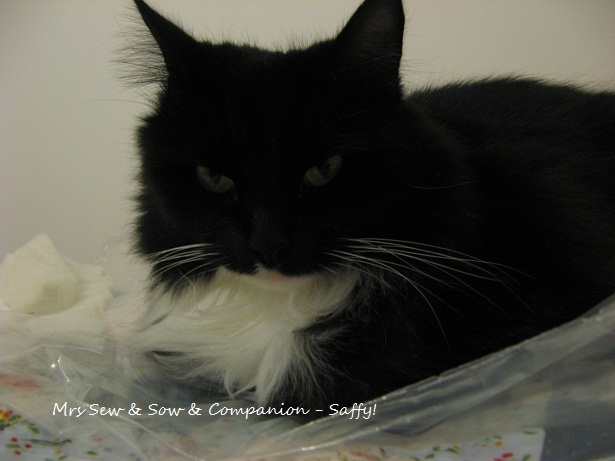 Both are lined and contain a little treat! 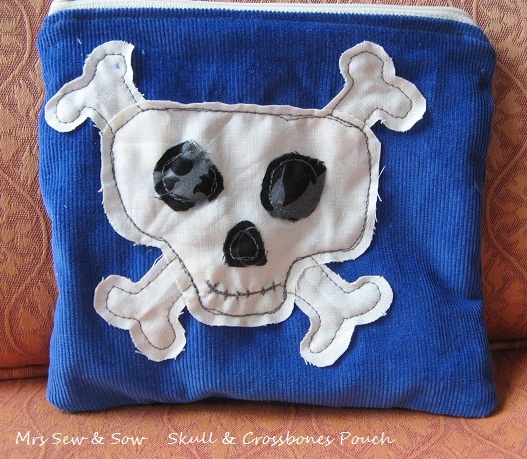 And here is a pouch for a more grown up teen who is more into gothy stuff I believe! 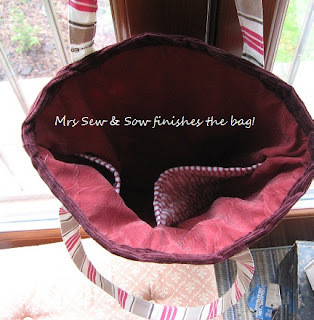 I found an image on google as my inspiration and put some of Alison's scraps to good purpose here! The cord I had in my stash already! 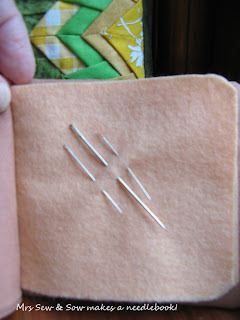 This zip was a lot easier to put in! Haha I wrote the words 'zip' and 'easier' in the same sentence - who'd have thought that a couple of months ago - not me for one! 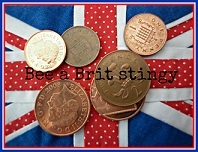 I am pleased with all and hope they are liked. It is still with us as we have not managed to catch it yet and return it to the outside world where it belongs...we may be sharing our Christmas with our little guest! Wonder if he gets a stocking too!? Oh and A Very Merry Christmas to One and All! Including our surprise guest! Thanks for sharing, supporting, advising, and just being with me on this little bloggy journey of ours ....it just would not be the same without all of you! 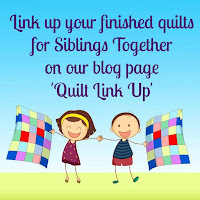 The lovely Alison at Little Island Quilting had a giveaway recently for the Sew Mama Sew Giveaway Day! And I was one of the winners! Well Alison must have tripped the light fantastic down to the PO to send on a gorgeous jelly roll of Moda Nature's Choice and a very generous bag of scraps - they arrived so quickly! Oh and I do love that cow card - specially the 'S'! What does that say about me ....yup I guess you are right crazy cow that I am! 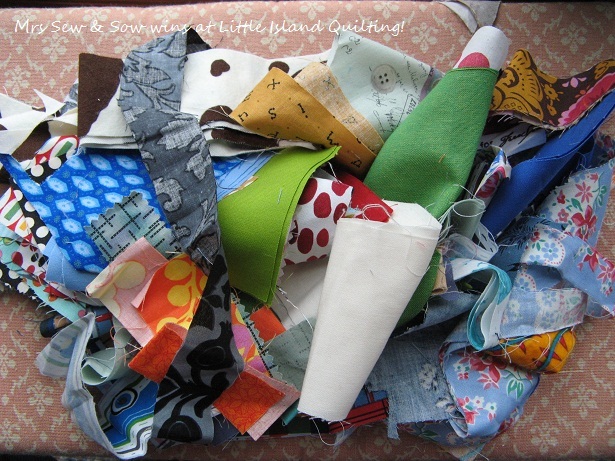 The scraps are in their own way more exciting than the jelly roll - don't you just love a window into someone else's stash....? No ? Just me then!? Crazy bovine indeed! Bearly Ready for Christmas 2011! Woohoo! Another UFO completed before the year is out! All quilted and bound! 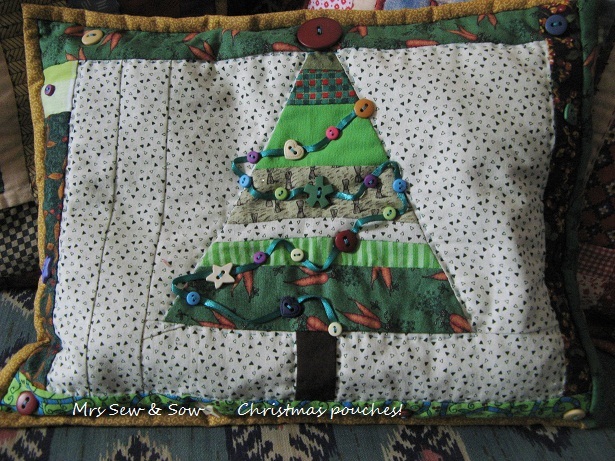 I'm calling it Bearly Ready for Christmas 2011 - because it it the Bear's Paw block and I am just squeezing it into this side of Christmas! 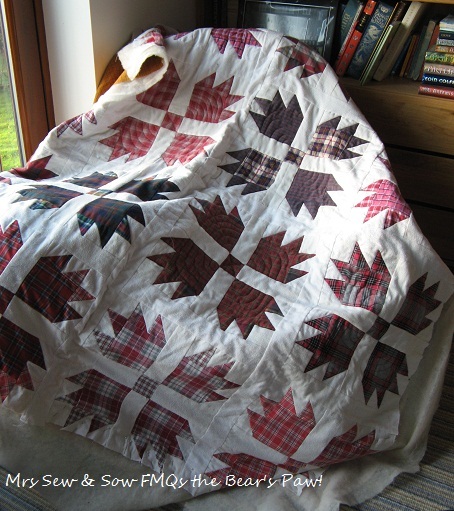 The top is all recycled fabric - old white flannel cot sheets and old flannel shirts! 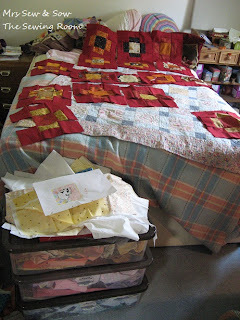 The wadding/batting is wool left overs from another quilt and pieced together. The backing was new but not quite enough for the quilt so I pieced a big Bear's Paw slightly off centre! 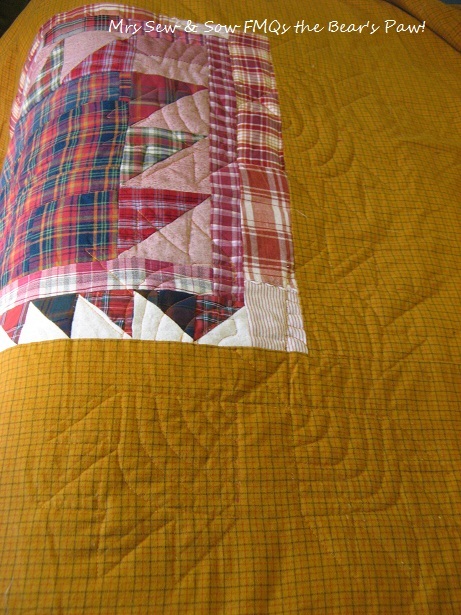 Quilted on the machine FMQ style with fans and outlining in Aurifil thread - fuchsia on the top and orange below! 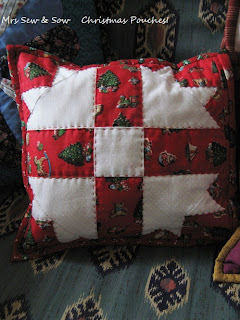 Maybe I should leave it out on Christmas Eve so Santa can snuggle up in front of the fire and get warm....? Now I wonder if I can finish another UFO before the year is out!? I ask myself the same question? 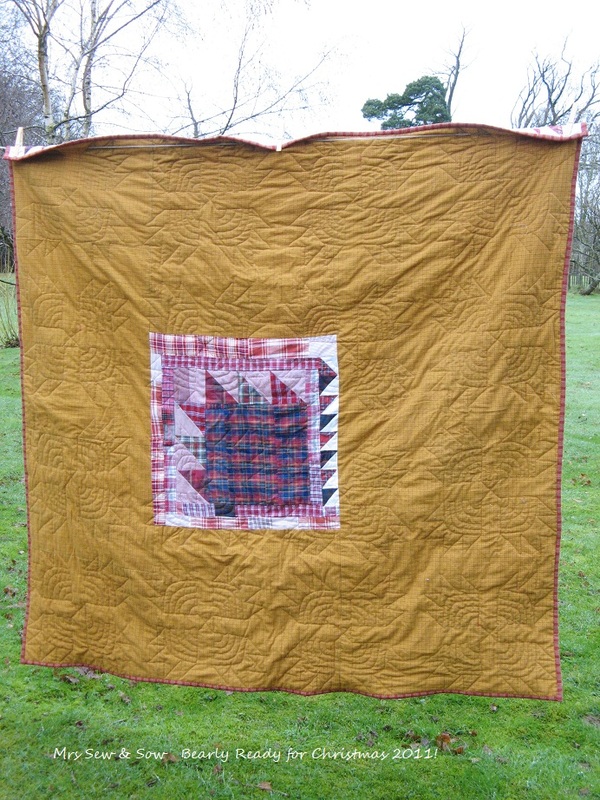 I should be making more things as Christmas pressies and instead I end up unpicking some really bad machine quilting I did earlier this year from before I discovered FMQ and practiced! 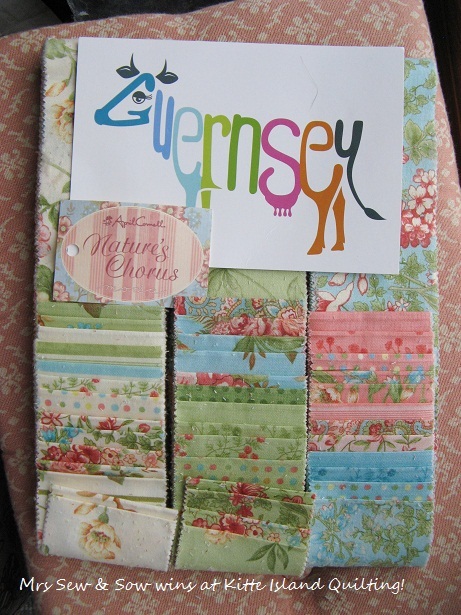 This is the back of the quilt with a lovely large ruck sewn in! Yeugh! 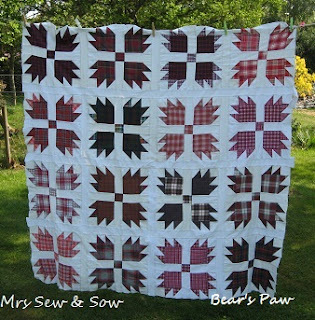 From the outset I wanted this quilt to be a tribute to naive piecing and the lovely Bear's Paw block. 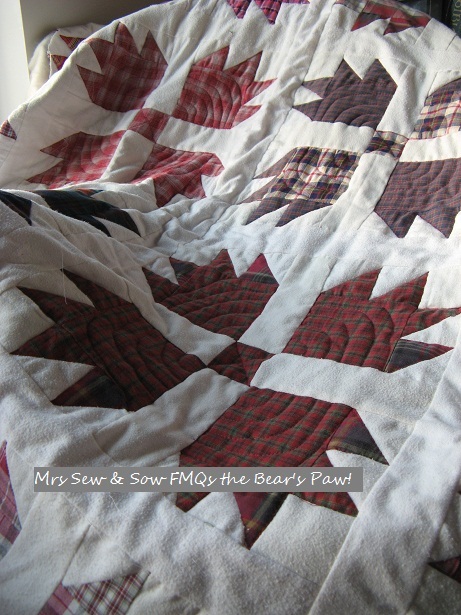 I wanted it to be a really primitive looking quilt in the make do and mend tradition of old and the recycling philosophy of now! I used old flannel from Worn and Washed and my children's old flannel cot sheets. I pieced blocks from whatever I had to, including making fabric to get the size of square or triangle I needed and didn't bother to match up the plaid fabrics when I did! 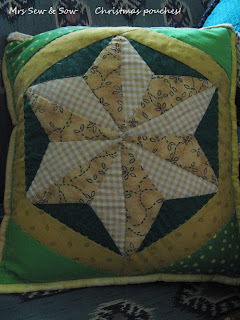 My first attempt at quilting by machine was a disaster - but I unpicked all of it! 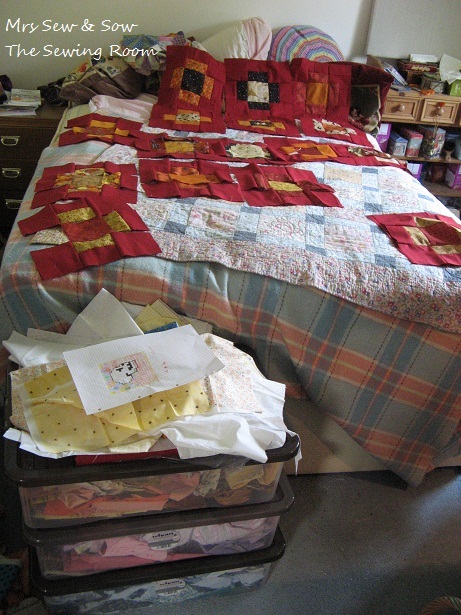 I decided to go FMQ with Aurifil again - red on top and orange underneath! 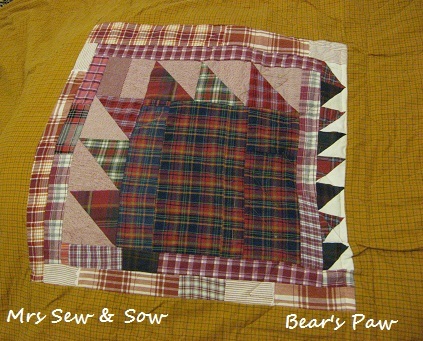 I would have loved to hand quilt a baptist/Amish fan over the whole quilt but my flannel backing was just too tough to get a needle and cotton perle through so I have machined my Baptist Fans in the square of the Bear's Paw and have outlined the triangles. I am loving the texture of the fans on the front and the back. Better view of the front now.. 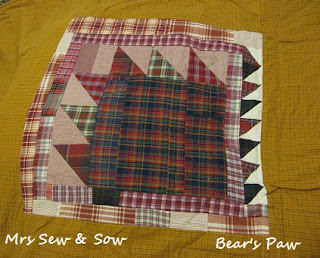 When I am finished quilting the blocks I may think about how to quilt those square shapes that appear in white between the Bear's Paws! But I will probably just bind it first so we can use it this Christmas....??? Oh I do hope so! 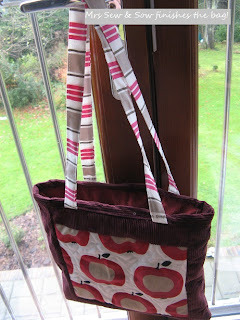 I spent way too much time making this bag but it is lined, quilted and has a quilted pocket inside. 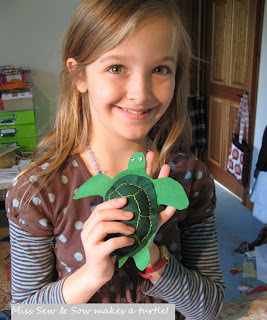 I need to make another one too! 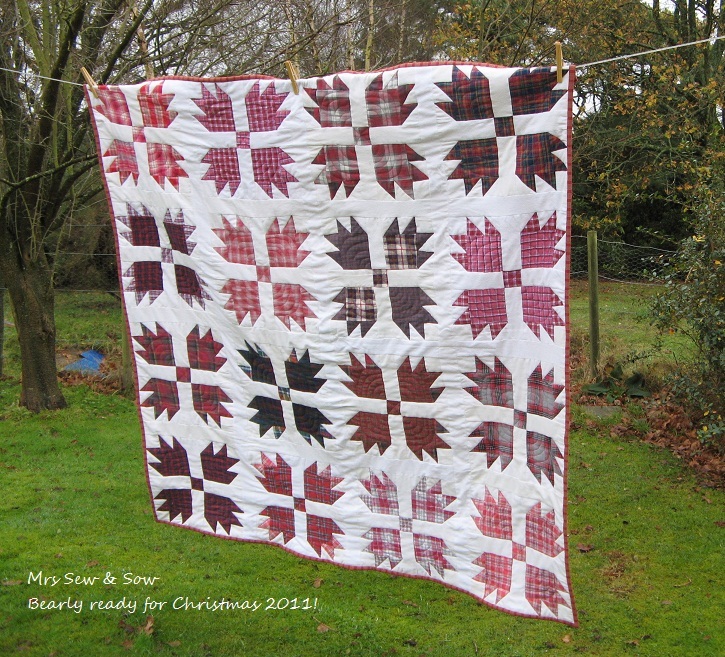 I am planning a few more makes before Christmas and am wondering if I will get everything done in time!? But I was not the only one making in the last few days - my eldest wanted a turtle to wear on her head - bizarre I know, it it has something to do with Hetalia and Spain!?? She set her young sister on the task and she has successfully accomplished the mission I think....? 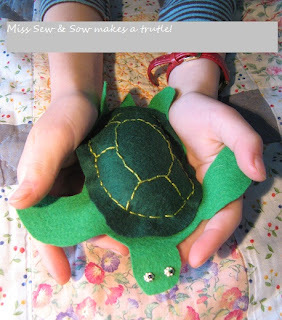 For some reason she doesn't think it is very good - is she suffering from the quilters over-critical eye already? I think so! Not much been happening around here for the last couple of days as I got an early Christmas pressie from the children - a nasty headcold! 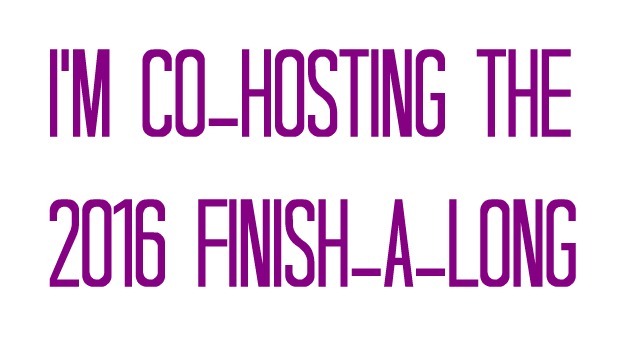 Over it now though and desperate to catch up on so many things! Need to make two girly pressies for teens and have decided to go with bags - always useful for carrying or just containing things I thought! 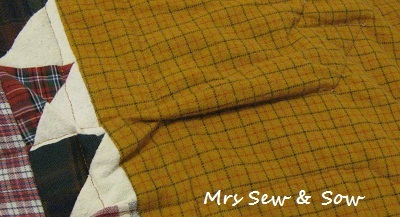 Here is the fabric for the lining and inner pocket - which goes better than it seems from the photo. 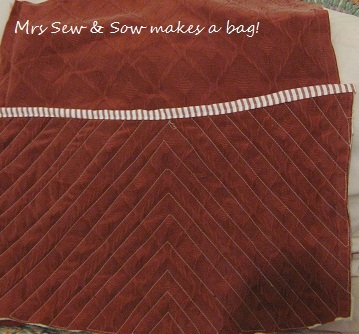 The pocket is quilted in chevrons too for a bit more substance and bound with a contrasting red/white stripe! 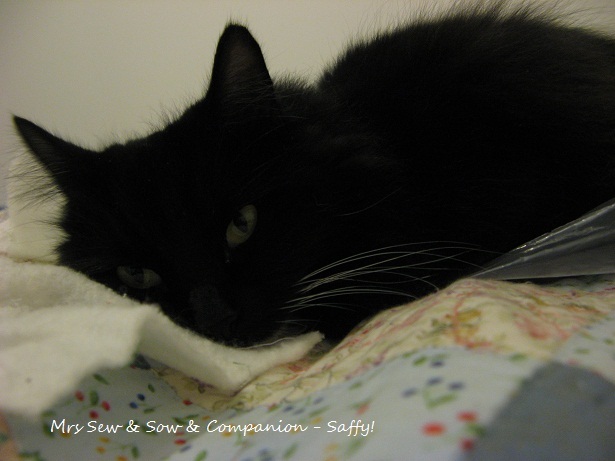 And just because I cannot show you a finish today here is my constant companion! Oops woke her up ! The third photo is a bit scary - she was only yawning but my she looks fierce! 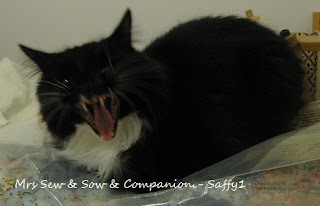 Seen a lion yawning on a nature programme - like that but a bit smaller! 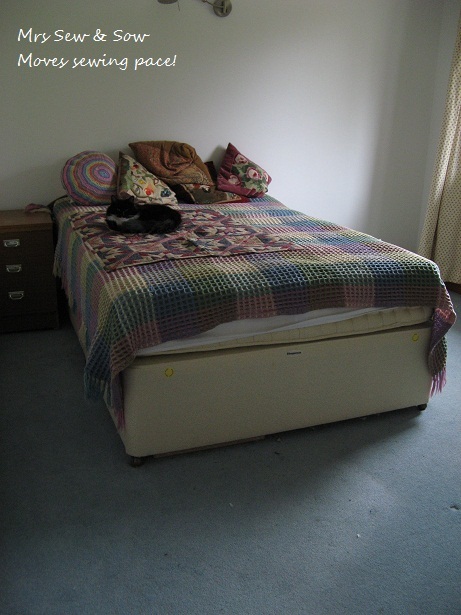 Here she is then and don't say I didn't warn you! Good thing I kept this photo small as I wouldn't want you having nightmares! 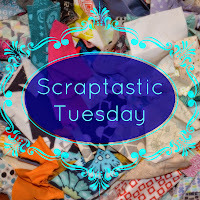 Five zippered pouches and FMQ Friday!